I learned at a recent presentation on behavioral finance that the original economists were former WWII strategists, applying the same rationale and statistics/probabilities from war to how people make decisions about money. They assumed if everyone knew the “best” outcome they would simply – and certainly – choose that. Ha, ha! That’s so funny! Almost all of our financial decisions are made using some degree of emotion (yes, even my rational engineers do!). Money gets to a tender place in all of us. It touches so many areas of our lives, and resides in so many layers. The trick, I think, is to find what drives your emotions (such as your values i.e. faith, justice, and harmony and needs i.e. security, comfort and understanding) so you at least know why you make the decisions you do…and then make the best choice you can based on those aspects of yourself. For example, if you value your family, make decisions that will truly benefit your family, and try to define what that looks like so you can recognize it. If you need security, what decision will make you feel more secure? 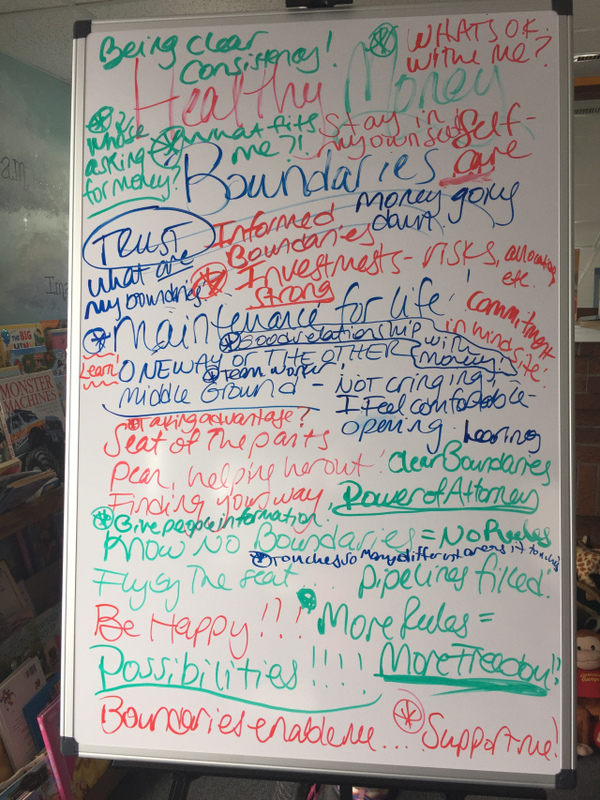 This is the white board indicating all the varied responses regarding boundaries. I’ve blogged about some aspects of this topic in regards to creating a personal financial policy. For example, when you’ve been invited to the umpteenth in-home sales “party” (i.e. cooking gadgets, jewelry, purses etc.) you can reply, “It’s my policy not to attend sales parties.” Done. Similarly, behavioral finance gurus Richard Thaler and Cass Sunstein coined the term choice architecture featured in their groundbreaking book, Nudge: Improving decisions about health, wealth, and happiness. One of Sarah’s financial protection policies uses the metaphor of a parking ticket: don’t just put in the $1 you think will cover your time and risk getting a $30 ticket, put in $5 that will cover you in case you’re late. to be consistent rather than conflicted. What’s nice about boundaries or financial policies is that they’re flexible to deal with life’s changing circumstances. Tracking your expenditures gives you good data to create a policy or boundary and can be the foundation of a workable budget. Side note: We meet upstairs from the cafe. At one point in our meeting, the smell of burnt toast permeated the air and distracted us from the conversation at hand. We all took it as symbol meaning there are times when we’re not paying attention to our finances and then something undesireable happens! Pay attention, don’t burn the toast! And reminded us that, often when we’re afraid, we’ll hunch our bodies over in need of comfort and protection. Sarah instructed us in making a “Power Stance;” a position of authority and control that gets the powerful energy within us to direct our highest and best choices (think “Wonder Woman”). Annette: Research, decide, trust, let go. 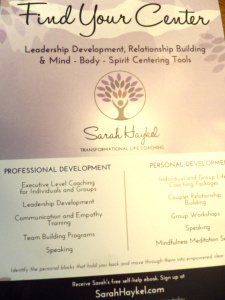 Sarah: Fluidity of cash flow, individualized and situational. Merridy: A tool for self-care. Heidi: The Power was there all along. Debbie: Money is a tool for intentional joy. Joy: Practicing Loving Kindness through blessing others with money. Ruthann: Not feeling stupid or regretting past decisions, feeling confident. 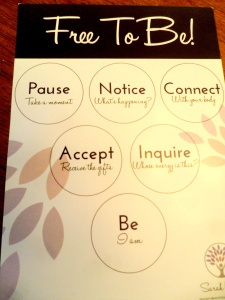 Anne: Pause and consider the possibilities. Can you see how joyful talking about money can be?! If you’re in WNY, join us! 0 responses on "Featured Blog : Creating & Maintaining Healthy Financial Boundaries"